This is a kinda random blog post, but if you follow my facebook page you may have seen a few "Did you see...." posts where I find random military things of interest to share. Well while searching on Pinterest I came across this photo that was uploaded by the user and thought it would be fun to share! I have not tried this yet, but would love to hear if anyone is successful in making these. 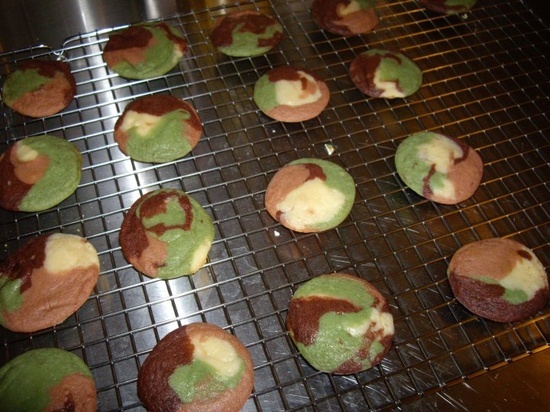 Then dyed in 2 different shades of neutral, and a green shade (Mix together and equal amount of red, blue, and yellow food coloring and it will be brown, or buy powdered brown food coloring or liquid food coloring) plus keep one ball of dough the original cookie dough color. Then baked as directed for cookie dough packaging!